It sounds unbelievable if we say leaves could carry very large objects and people. 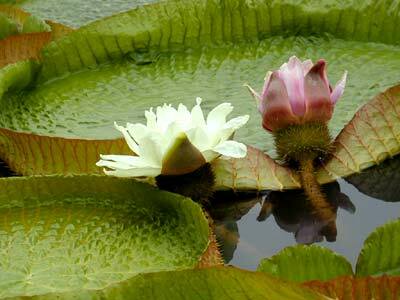 However, this is the real case with royal water lily of the Amazon valley in South America. Royal water lily is a famous ornamental water plant and it has the largest leaves among all water plants of the world. Its leaves could grow to as large as more than 3 meters in diameter. The surface of the leaves is quite smooth, and the edges of the leaves roll up; they look quite like small boats floating on the water. The nerves of royal water lily have different structures from other plants, which are like ribs or the framework of an umbrella; therefore, they have very good buoyancies, and could carry objects as heavy as 60 to 70 kilograms in the maximum. This surprising buoyancy is much greater than other water plants. If a child sits on a royal water lily leave, he (she) would feel as if he (she) is sitting on a small and round boat, and would feel quite happy. The flowers of royal water lily are large and beautiful. The diameter of the flower could be as many as 30 cm and is much bigger than those of common lotus. The flower has more than 60 pedals and rank orderly within the sepal. Generally, a flower could blossom for three days; and it usually opens at dusk and closes in the morning; besides, the color of the flower changes in different times. At dusk of the first day, the buds are as quiet as a virgin, the flower is milk white, and would begin to open at about 19 to 20 p.m.; the flower would open up entirely within half an hour; the flower is as white as jades, and the smell it gives off is strong and fragrant, like that of orchards; the aroma usually attracts many insects, which fly to and fro in-between the stamen and the necking to pollinate. The flower closes in the next morning and would open up again at dusk, and the pedals of the flower also change from white into pink; when the flower opens up for the third time, the color of the pedals would become further deeper, and would change from pink into dark red. The flower would wither away when it changes into purple. The flower would then sink into the water to have seeds and to give offspring. When its fruits are ripen, there would be as many as 500 to 600 seeds in it, which are as big as beans; the seeds are rich in eligible starch, thus, the local folks often call it "corn in water".